Serious hikers have known the great benefits of trekking poles for decades. Aside from providing stability while hauling a heavy load or moving over technical terrain, trekking poles have distinct advantages even on easy trails. They’re great for setting a rhythm when covering long distances and significantly reduce load and impact on hips, knees, and ankles when going downhill. As with most hiking and backpacking gear, balancing weight and durability is the most common consideration. Recent design breakthroughs, like the folding trekking pole, have pushed the total weight of some models to well under a pound, but these streamlined options are not for everybody. For more information, see our comparison table and buying advice. 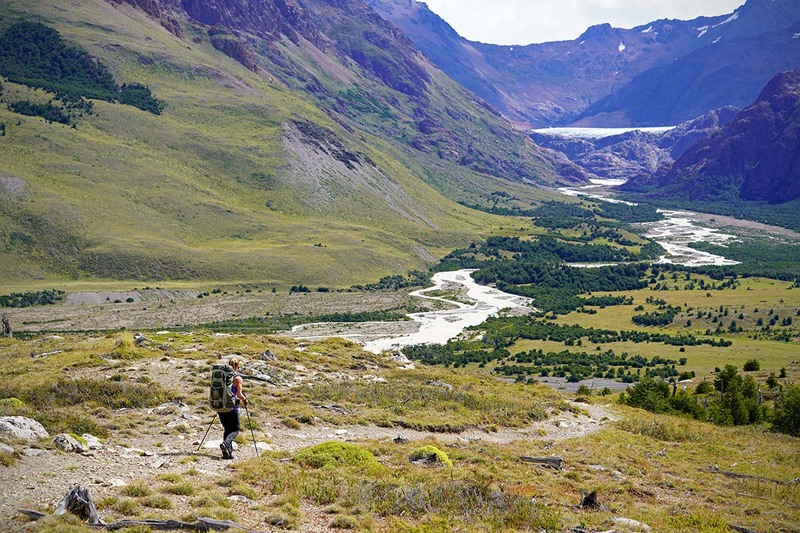 Below are our top trekking pole picks of 2019. What we like: Solid construction, comfortable feel, and good price. What we don’t: A little heavy and long collapsed length. The carbon fiber and folding designs that get all the attention in the trekking pole market are impressive innovations, but for hikers that just want a pair of trustworthy sticks at a good price, we recommend the Black Diamond Trail Ergo Cork. At $130, they’re a solid value and come with very few compromises. In fact, the all-aluminum construction is only an ounce heavier than the premium Leki Micro Vario below but is still plenty sturdy for most dirt, rock, and snow travel. The Trail also has Black Diamond's comfortable, ergonomically-shaped cork grips and reliable FlickLock length adjusters. What are the downsides of the Trail Ergo? For travelers, climbers, or those that prioritize collapsibility, the 27-inch minimum length may be an issue. It shouldn’t get in the way when strapped to the outside of a pack, but it is a couple inches longer than many other 3-section designs (and it can’t come close to a true collapsible pole). As downsides go, that’s pretty insignificant for most folks, and the Trail Ergo Cork’s stand out as our favorite all-around trekking pole. What we like: Well-rounded lightweight and packable design. 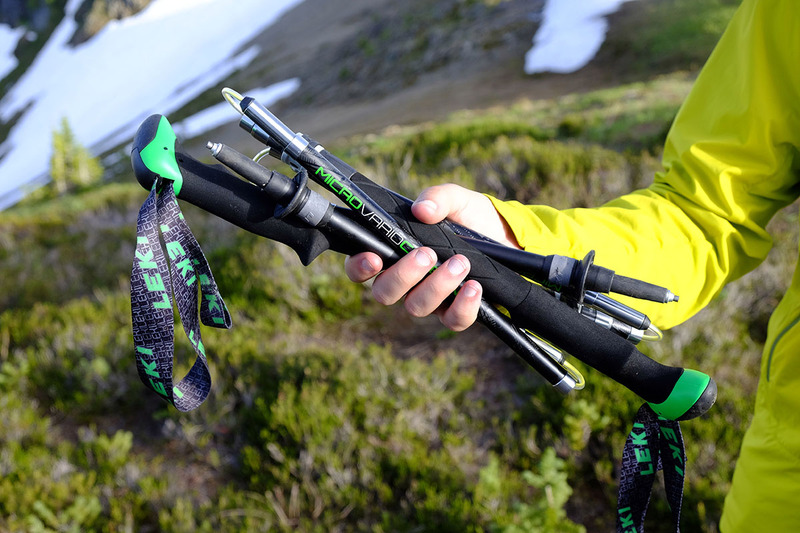 Leki’s Micro Vario Carbon poles are a no-compromise option for the lightweight crowd. Weighing just over 1 pound for the pair, they manage to squeeze a full set of high-quality features into their compact and foldable construction. Unlike many competitors, you get nearly 8 inches of adjustment with a Leki’s SpeedLock 2 system, and we’ve found the poles to be among the most user-friendly for both folding down and setting up (we can do both without having to take a break while hiking). On the trail, the Micro Vario’s weight savings is noticeable, particularly over a long day. You do sacrifice a little in terms of durability, but the carbon shafts have been sturdy enough for crossing glaciers, leaning on during steep descents, and as the structure of a trekking-pole supported shelter. We do prefer cork grips to foam, but these are the nicest and most comfortable foam grips we’ve used, and the choke-up extensions are great for extended climbs. Leki also offers the Micro Vario Carbon in an even pricier $230 AS version, which includes a low-profile shock system for added trail comfort. Weight per pair: 19.2 oz. What we like: A great price, making them a nice option for casual use. What we don’t: Lacking in toughness and long-term durability. Montem is a relatively young outdoor gear company based in New York City, but is rapidly making waves in the trekking pole market due to the surprisingly low prices. Their leading model is the Ultra Strong, which has an aluminum build, lever locks, and comfortable foam grips. At 19.2 ounces, the poles are a little heavier than the premium options above, but should be plenty light for most day hikers and backpackers. Further, the poles have a short 24-inch minimum length, which is great for travel. But what sets the Ultra Strong apart is price: at only $60, they compete with poles that cost twice as much from Black Diamond, Leki, and REI. What do you sacrifice at this price? Sturdiness, for one. 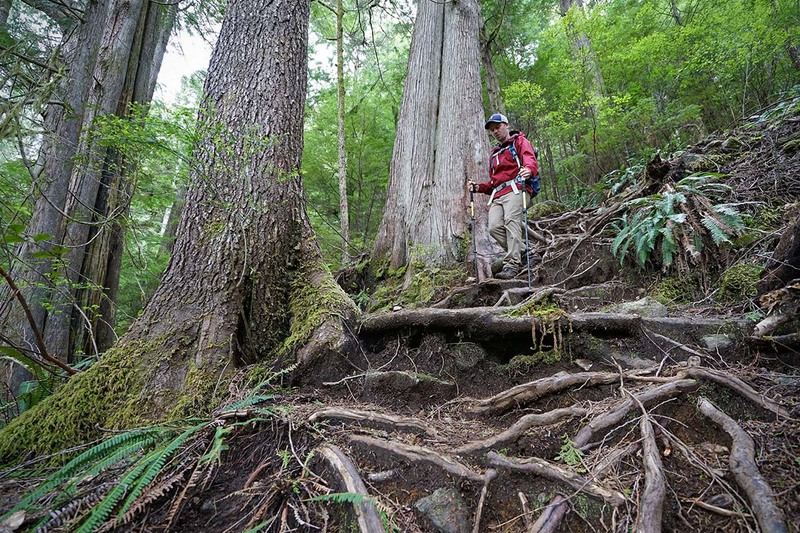 We took the Ultra Strong poles on a remarkably steep hike on Vancouver Island, and were surprised by the level of vibration and worrisome clicking throughout the descent. For heavy use and difficult terrain, these poles pale in comparison to the build of a more rugged model like the aluminum REI Traverse. Montem did, however, nail important details like choke-up extensions on the grips, in-field adjustments for the locking mechanism, and easily adjustable straps. At just $60, they’re fine for light use and easy to moderate day hikes, but we didn’t find them confidence inspiring enough for tough terrain. Weight per pair: 10.6 oz. What we like: Incredibly lightweight, well made. What we don’t: Not too durable; expensive. Taking the lightweight crown is the thru-hike-ready Gossamer Gear LT5. These carbon fiber sticks are listed at an incredibly low 10.6 ounces for the pair (you can save even more weight by ditching the straps), which keeps arm fatigue to an absolute minimum. Combine the feathery weight with a simple, reliable build and comfy foam grips, and you get the ideal trekking poles for long adventures where every ounce matters. They’re also adjustable, although the twist lock system isn’t our favorite (we prefer the added security of a lever lock). Naturally, there are a few compromises in making the LT5 so light. To start, relative to the rest of the market these poles aren’t super durable—it’s best to stick to established trails and avoid too much snow. Further, they’re a pricey investment at $195 considering their relatively simple feature set (the similarly expensive Leki Micro Vario above, for example, can be folded into a much smaller length). But if you take good care of them and don’t need them for travel, they’re about as good as it gets for an ultralight build. It’s worth noting that Gossamer Gear offers replacement sections of their poles should you damage one, which is a rarity in the market. Weight per pair: 14.8 oz. What we like: Excellent value for the specs and quality. What we don’t: Not as tough as our top picks. For backpackers looking to keep weight to a minimum, the REI Co-op Flash Carbon poles are a great option, undercutting other high-end competition by $20 or more. At under a pound and with a carbon composite build, the poles are light in the hands and feature soft foam grips. We still give the overall edge in comfort to cork, but foam does absorb and dissipate moisture well when it’s hot and humid outside. The exterior aluminum Power Lock mechanism is a nice step up in quality from the previous plastic version (and what you still get with the REI Co-op Traverse below). Unlike the Black Diamond above, however, we wouldn’t consider the Flash Carbon poles a go-to option for winter treks. With the available snow baskets, they’re great for casual snowshoeing but a little too ultralight for serious 4-season use. This shouldn’t faze most hikers and backpackers however, and with REI’s excellent return policy to back them up, the Flash Carbon poles are a very solid carbon trekking pole option. What we like: Proven toughness, good all-around abilities. What we don’t: Rubber grips aren’t the most comfortable. As a market leader, Black Diamond has a fairly extensive trekking pole line-up. A consistent favorite is their budget-oriented Trail Back, which in many ways is a trimmed-down version of the Trail Ergo Cork above. You lose the ergonomic shape and cork grips, but the two trusty FlickLocks remain, as well as the sturdy aluminum construction. Further, among the options at under $100, the Trail Back’s have a longer track record of durability than the Montem above (but do cost $30 more). What are you giving up with a mid-range pole like the Trail Back? To start, they are rather heavy at 20 ounces for the pair and therefore not a top choice for long-distance backpackers or thru-hikers. Also, the rubber grips are a definite step down in comfort from foam or cork, which do a better job absorbing sweat and preventing chafing while on the trail. But the Trail Back’s strong, no-nonsense construction makes a lot of sense for those looking to keep cost in check while not sacrificing much in terms of quality. Weight per pair: 9.3 – 10.4 oz. What we like: Huge stability benefits with little to no arm fatigue. What we don’t: Not intended for rough, alpine use. The Distance Carbon Z is Black Diamond’s lightest weight Z-Pole model and best used for light and fast pursuits. When released, Z-Pole technology was a major innovation to the trekking pole market, and it remains impressive in its current form. A sleeve on the top section moves down from the grip, cones on the ends of each of the connected sections ensure they each fit together, and a small button pops into place to secure everything. From compacted to deployed is a two-second affair. All four fixed-length sizes weigh in at about 10 ounces per pair, making them so light that they’ve even become popular with long-distance trail runners. Just over a foot long when compacted, the Distance Carbon easily fits in a daypack. The Distance Carbon is stiff overall but still not quite durable enough to handle the rigors of extended snow travel or alpine use—Black Diamond also offers more substantial options for backpacking, like the slightly heavier Alpine Carbon Z. Also, if you prefer a little adjustability, check out the Distance Carbon FLZ, which includes a single FlickLock at a pretty minimal weight penalty. What we like: Cork and lever locks at a great price. What we don’t: A little heavy, lacks grip extensions for uphill travel. 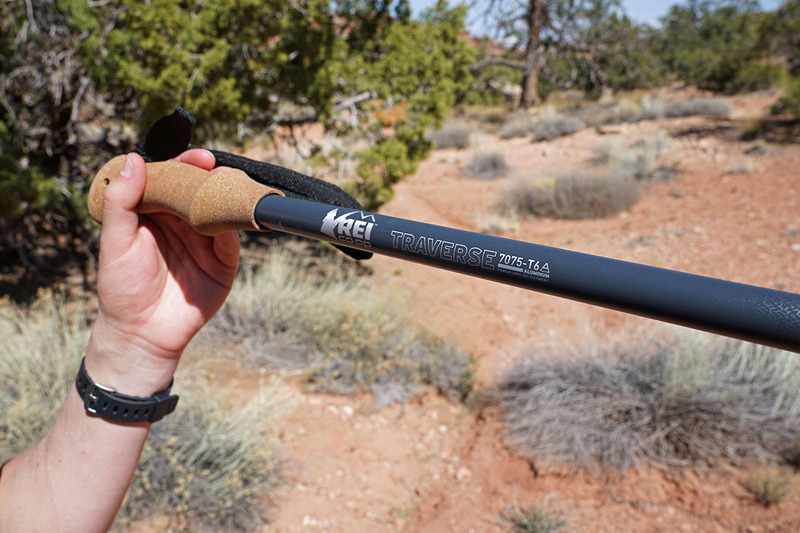 The 3-section REI Traverse Power Lock is a midweight trekking pole at a good price. Most impressively, you’re getting a cork grip and lever locks for $100. The external locking mechanism is used across a variety of models from Komperdell and REI, isn’t prone to slipping when hiking, and is easy to operate while wearing gloves or mittens in the winter. While it’s not as nice as the upgraded metal Power Lock found on the Flash Carbon above, the plastic design still works fine. It’s all about reliable performance here, and the quality aluminum shaft is strong enough for anything from quick day hikes and snowshoeing to multi-day trips. These poles can take a beating, and are much sturdier feeling than the Montems above (aluminum poles of roughly equal weight). Tungsten carbide tips are both durable and provide nice bite on all types of terrain. And although 27 inches collapsed is a little long, they could potentially be stuffed into a checked bag on an overseas trip. The poles also lack a grip extension for choking up on long climbs, but outside of those nitpicks, your only other sacrifice at this price is the extra ounces in weight. Weight per pair: 20.4 oz. What we like: Collapsible to 15.5 inches. What we don’t: Heavy for a folding model. With a folding-style design, Leki’s well-loved and ergonomic cork grips, and a competitive price of $140, the Micro Vario Ti Cor-Tec is one of our favorite poles in this category. This aluminum model folds down to a mere 15.5 inches, which is among the smallest on our list. And we love Leki’s SpeedLock 2 locking system—it can be tightened with a small dial, no extra tools needed. The ability to easily keep the locks tight adds to the already durable nature of these poles. As expected, there are tradeoffs to this design. As with other folding trekking poles, the Micro Vario Ti Cor-Tec is compact, but it's quite heavy at over 20 ounces for the pair (the sacrifice of the more affordable price tag and alloy build). Additionally, folding poles in general are less sturdy than their telescoping counterparts, making these some of the least weight-bearing aluminum poles on this list. That said, they’ll surely take a beating better than the carbon fiber Leki Micro Vario Carbon and the BD Distance Carbon Z above. What we like: A collapsible pole for under $100. The folding Halite from Mountainsmith is a less expensive alternative to poles such as the Leki Micro Vario and BD Distance Carbon Z. You’ll notice a big jump in weight with the aluminum and more cost-friendly construction, but these poles still collapse down to a competitively small size, perfect for sticking inside your carry-on luggage or daypack. And with cork handles and hiking baskets, snow baskets, and rubber tips included, they are a good value at just $80. The Mountainsmith Halite is a nice choice if you need the compact folded size, but there are sturdier, higher quality options for the price. We do like the cork grips and padded wrist straps on the Halite, though they don’t hold a candle to Leki’s ergonomic cork grips. The simpler folding mechanism, which uses a vinyl coating compared with the Kevlar on Black Diamond’s Z-Poles, isn’t as sturdy or reliable for extended use. But the Halite excels for travel and light day hiking. If you don’t require the compact folding design of the Halite, Mountainsmith’s Tellurite is a nice telescoping alternative for $15 less. Weight per pair: 17.4 oz. What we like: Quality cork grip and low-profile shock absorption system. What we don’t: Not a great all-around value. 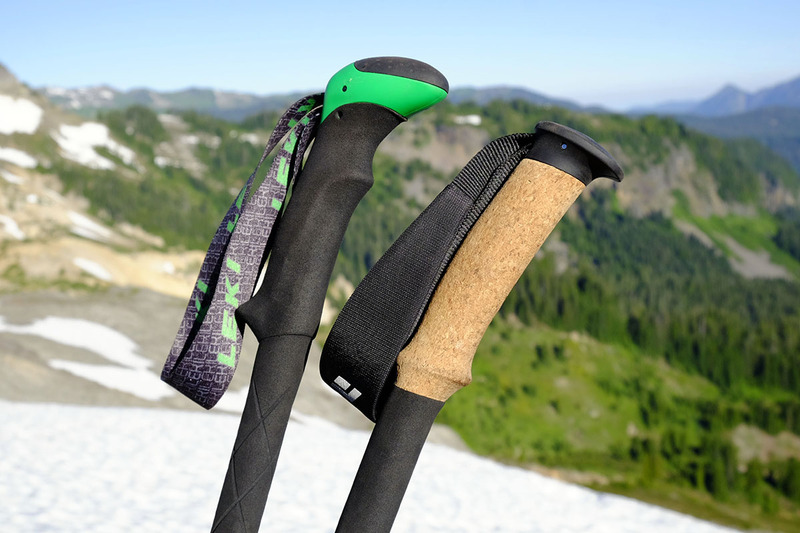 Leki has built a reputation around its super comfortable cork grips and their ergonomic shape. With a slight forward tilt, they have a very natural feel in the hands, and the build quality of the grips is second to none. Their 2019 Makalu Lite carries on this tradition while including modern features like a low-profile shock absorption system and minimalist strap design. You miss out on Leki’s top-end SpeedLock 2 at this price point, but their simplified SpeedLock Plus remains a solid partner. Expect consistently strong holds, and, as an added bonus, you can adjust the locking mechanism without a screwdriver. Priced at $140, you’re getting on the spendy side with the Makalu Lite to still have an aluminum shaft. It’s the cost of high-end componentry, however, and the quality 7075-series alloy helps keep weight in check at 17.4 ounces for the pair. In the end, their relatively high price does bump them down a few spots—the REI Traverse above has a similar construction (other than the shock system) and is $40 less—but they remain a solid choice if you want shock absorption with few compromises. What we like: Cheap and very light. What we don’t: Not built to last. Carbon fiber typically is associated with high-end builds and premium prices, but Cascade Mountain Tech offers a pair of carbon poles for under $50. On paper, the poles stack up really well with a 16-ounce weight, simple lever locks, and foam grip extensions. Impressively, Cascade Mountain Tech didn’t skimp on accessories either, with rubber tips and 2 sets of baskets for mud and snow. The Carbon Fiber poles are available with either a foam or cork grip, and while we typically prefer cork, we lean towards foam in this case as a cheap cork grip will break down over time. The main downside in choosing the Cascade Mountain Tech poles is durability. The carbon shaft does a great job keeping weight low, but is more likely to get a crack or snap under a load than another budget pole like the aluminum Montem above. Moreover, the overall construction is rather cheap and the cost cutting in the plastic adjustment system doesn’t inspire confidence in its longevity. But if you take good care, going with Cascade Mountain Tech gets you a pair of lightweight poles for about 1/3 of what you’d pay for carbon from a company like Black Diamond. Weight per pair: 20.3 oz. What we like: Proven shock-absorbing system. What we don’t: Extra weight and price. We typically don’t recommend trekking poles with serious shock absorbing technology—they generally are heavier, more complex, and shock absorption isn't necessary for many hikers. But if the extra give is a must-have feature for you, the Black Diamond Trail Pro Shock is worth a look. 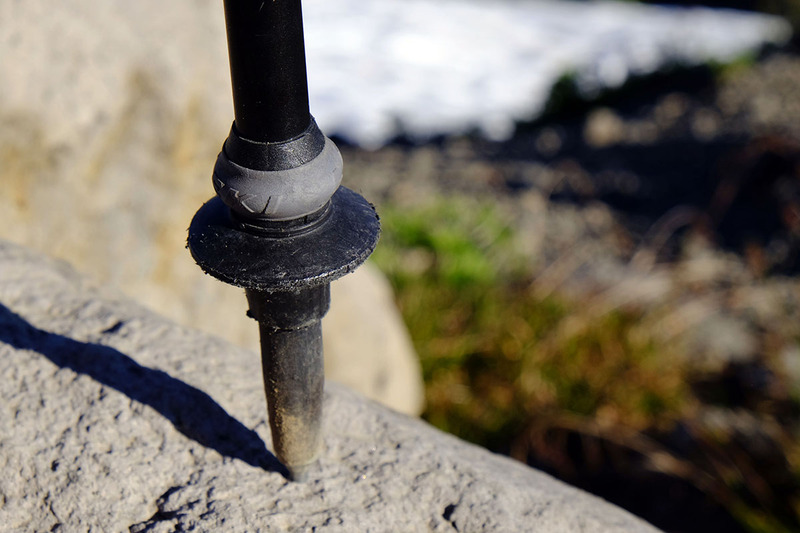 Impressive damping and rebound control built into the pole’s handle helps avoid a common pitfall of anti-shock poles: bottoming out and an unpredictable rebound. The system works quite seamlessly, and reacts well to both light and hard impacts. The rest of the set-up is classic Black Diamond, with quality materials and components like their metal FlickLock Pro. Cons are the expected sacrifices for the Trail Pro Shock's additional tech. Weight goes up relative to non-shock absorbing options at over 20 ounces, and you pay a bit of a price premium as well. At $150, we’d prefer cork grips, but the foam handles with choke-up extensions still are fine performers. All told, the Trail Pro isn't for everyone, but its 4-season-ready construction and functional shock absorption earn it a spot on our list. Weight per pair: 18.5 oz. What we like: Simple and cheap. What we don’t: Cheap locking mechanism, not as comfortable. The most important thing to know about the Kelty Upslope 2.0 is its price: $40 for a pair of decent aluminum trekking poles is an absolute steal. Kelty even includes rubber tips for pavement walking and extended foam grips should you need to choke up for uphill travel. For the casual user or someone interested in trying out trekking poles for the first time, the Upslope 2.0 is a fine option. What are you giving up for the Upslope’s discounted price? The main compromise is the locking mechanism. In contrast to the strong lever locking systems above, the Upslope uses a twist lock. For easy trails, these should provide sufficient holding power, but under a lot of strain and over time, they are more likely to start slipping. Part of the reason is user error: it is relatively easy to overtighten or loosen the locking pieces to a point where they start to fail. But there’s a reason lever lock systems dominate the market in 2019. Weight per pair: 24 oz. What we don’t: Too basic and flimsy for a lot of uses. The BAFX Products Anti-Shock poles are a cheap but suitable option for light use on non-technical trails. These simple hiking sticks have a feature set that reflects their $20 price tag: you get finicky twist locks that are prone to slipping, basic grips, and a heavy 24-ounce weight. On the upside, the shaft is made of aluminum that should hold up decently well to rough treatment, and BAFX Products includes mud baskets and 2 sets of rubber tip covers. In addition, the built-in springs help to alleviate some of the vibration that you often get with cheap trekking poles. If you have plans of logging significant miles or need to rely on your poles over serious terrain, we highly recommend opting for one of the models above. These poles are just not built well enough to trust on anything more than easy trails. They can be suitable for the right person and circumstances, but we think it’s worth spending up for the Montem, Cascade Mountain Tech, or Kelty budget options above. Black Diamond Trail Ergo Cork $130 Telescoping Lever 18 oz. Aluminum Cork 27 in. Leki Micro Vario Carbon $200 Folding Lever 16.9 oz. Carbon Foam 15 in. Montem Ultra Strong $60 Telescoping Lever 19.2 oz. Aluminum Foam 24 in. Gossamer Gear LT5 $195 Telescoping Twist 10.6 oz. Carbon Foam 23.5 in. Black Diamond Trail Back $80 Telescoping Lever 20 oz. Aluminum Rubber 25 in. Leki Micro Vario Ti Cor-Tec $140 Folding Lever 20.4 oz. Aluminum Cork 15.5 in. Leki Makalu Lite AS $140 Telescoping Lever 17.4 oz. Aluminum Cork 27 in. Black Diamond Trail Pro Shock $150 Telescoping Lever 20.3 oz. Aluminum Foam 26 in. BAFX Products Anti-Shock Poles $20 Telescoping Twist 24 oz. Aluminum Plastic 26.5 in. Editor's Note: "Length" is the minimum or collapsed length for the trekking poles. Telescoping poles made of two or three sections are the most common type on the market, and are known for their durability and ease of use. As such, they’re popular with everyone from day hikers to backpackers and even mountaineers. The different pole sections expand from each joint by a locking system that can be opened for adjustment and secured while on the trail. These points of connection also are their greatest weaknesses, so a quality locking mechanism is highly recommended (we discuss this in more detail below). In this category, we prefer light poles with simple feature sets: secure locking mechanisms, quality aluminum or carbon fiber construction, and comfortable grips. 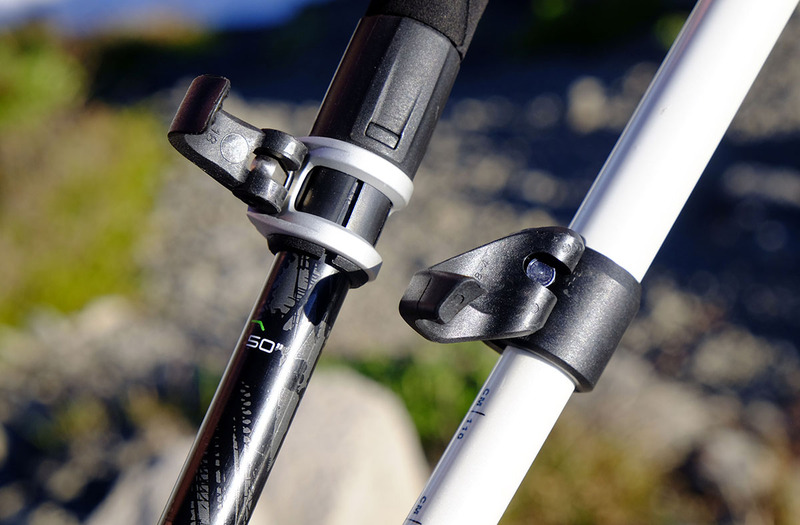 A third category of trekking pole is the straight-shaft, fixed-length design. These are relatively uncommon because it can be difficult to store or transport such a long item (especially when fastened to your pack or in a suitcase), and they can’t be adjusted for up and downhill travel. As such, no fixed-length poles made our list. If you’re in the market, however, we recommend checking out the Ultimate Direction FK. They are among the lightest trekking poles made at 8 ounces for a pair. 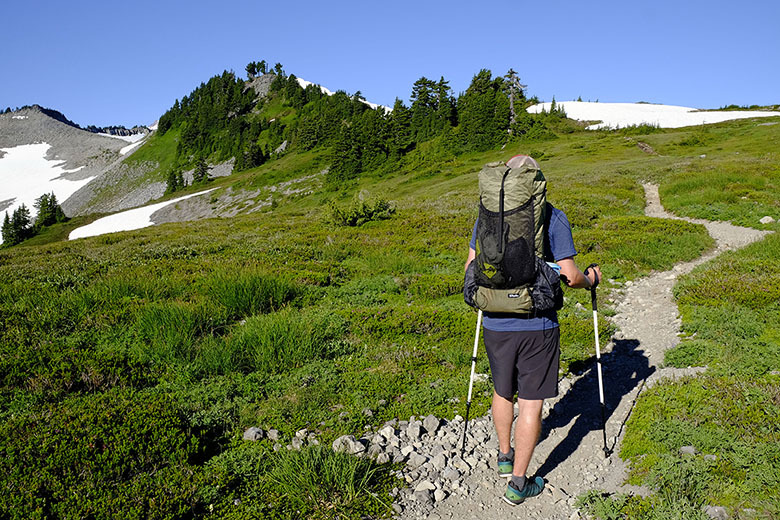 Generally, trekking poles are made either from carbon fiber, aluminum, or a combination of the two (a three-section pole may have two carbon upper pieces and an aluminum lower, for example). 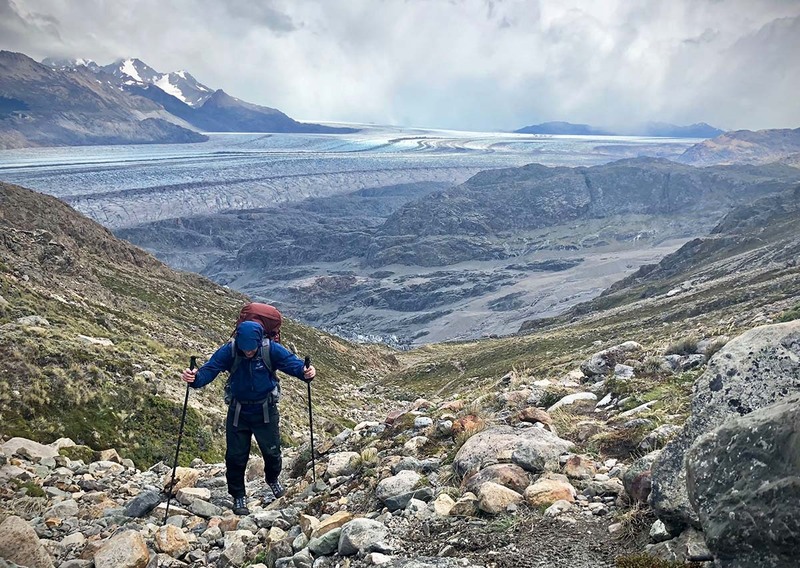 High-end trekking poles are often made from carbon, which is lighter and stiffer but also more expensive and brittle (and when carbon fiber breaks, it breaks; aluminum may just dent or bend and still be usable). Carbon’s tendency to snap under hard stress can be somewhat offset by a thicker diameter construction, at the penalty of weight. 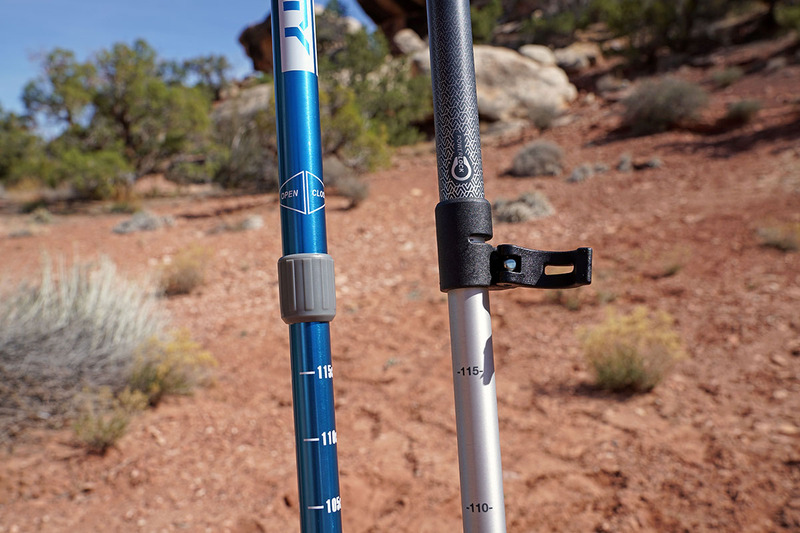 Price and overall durability are the main reasons hikers opt for aluminum poles. There's something to be said about a confidence-inspiring design like the Black Diamond Trail Ergo, which is super stable and has virtually no wobble even on steep descents. In the end, the casual hiker or someone that is rough on their gear will probably be happiest with an aluminum or hybrid aluminum/carbon pole. On the other hand, an all-carbon build remains the best option for the weight-focused hiker/backpacker. Outside of an ultralight folding trekking pole, chances are you’ll be eying one with some sort of locking mechanism. The classic style used a twist lock: to tighten you twist each section closed to lock the segments into place. These poles are haunted by inconsistent performance, with hikers either over-tightening to the point of seizing, or twisting too loose, resulting in perpetual issues with collapsing. Needless to say, the twist lock has gone out of vogue. And while there are a few models out there that do a good job—such as what you get on Gossamer Gear's LT5—we typically recommend avoiding the twist lock. Enter the lever lock. Using an external clamp to either open to adjust or close to lock the pole sections, it’s an easy to use system. Better still, the tendency for segments to slip when in the locked position is significantly reduced, giving additional confidence to the user. There are still a few risks of incidentally opening the lock when moving through heavy brush or the need to occasionally tighten the lever with a screwdriver (Leki’s SpeedLock Plus on the Micro Vario Ti Cor-Tec doesn’t require a tool to adjust), but these are minor nitpicks. The lever lock is the new standard. Trekking pole grips come in three main types: cork, foam, and rubber, with cork being our personal favorite. A quality cork handle has an exceptionally comfortable feel in the hand and wicks sweat very well. It also will conform nicely to your hand over time, making it great for long-distance treks and multi-season use. If cork isn’t your thing, the next best bet is foam. EVA foam is soft, provides a measure of shock absorption, and does a decent job at wicking moisture in the summer months (although it will typically retain more moisture than cork). Rubber is the third option and usually found on budget trekking poles. We’ve found these grips to be best for cold weather activities because they shed rain and snow, but they lack the sweat absorption and premium feel of foam and cork. Looking beyond the grip materials, another consideration is whether or not to get an ergonomic handle. These types of grips have a slight forward angle, typically around 15 degrees, which is supposed to mimic where your hands would naturally rest. Not surprisingly, what feels “natural” to one person may not to another, and this in the end is a very personal choice. That being said, we’ve enjoyed our fair share of ergonomic grips (Leki is a standout in this area, and we also like Black Diamond’s Ergo models). Many poles will have a second, smaller grip below the main one. This is what we refer to as a choke-up extension, or extended grip. These predominantly foam grips are great for finding a secure hold lower on your poles while climbing steep hills or sidehilling, improving balance and leverage. For those who often travel on steep or technical terrain, extended grips are a must-have feature. For a DIY alternative, you can wrap duct tape around your poles under the large grips for a more secure hold. The final piece in the grip construction is the wrist strap. There is an impressive diversity of strap designs, ranging from heavily padded to simple nylon. And some hikers ditch the straps altogether because they’d rather not be connected to their poles should they take a fall or use the system improperly (correct technique is entering from the bottom opening of the strap). In choosing a strap, the biggest consideration is noticing any potential irritants. If a seam is rubbing against the back of your hand on a short walk, that can turn into serious chafing by mile 10. In general, the straps on most quality trekking poles are very comfortable. Even the simple webbing on the Leki Micro Vario Carbon is very smooth. The weight of the trekking poles is our second biggest consideration (first is comfort), and we wouldn’t blame you for putting it atop your priority list. A light pole will fatigue your arms less quickly, which is a big benefit on long treks. On short trips, you may not notice a 2-ounce difference, but when you think of the number of times your arms swing forward over an extended trip, it’s easy to realize how a little weight savings can go a long way. For moving light and fast, the lighter the better, with a caveat that durability diminishes once you get into the ultralight category (we see it happen right around 1 pound). On the extreme end are poles like the Gossamer Gear LT5 (10.6 ounces for a pair) or Black Diamond Distance Carbon Z (9.3 to 10.4 ounces, depending on length). These are great for ultralight backpackers and thru-hikers, but the shaft materials are too delicate for bushwhacking or 4-season use. Our preference is to go lightweight without having to be constantly worried about snapping the poles, which is why we rank the BD Trail Ergo atop our list. Packed size or collapsed length isn’t a make-or-break specification for us, but it is a consideration for travelers that need to fit their poles into a suitcase and hikers that strap their poles to their pack. 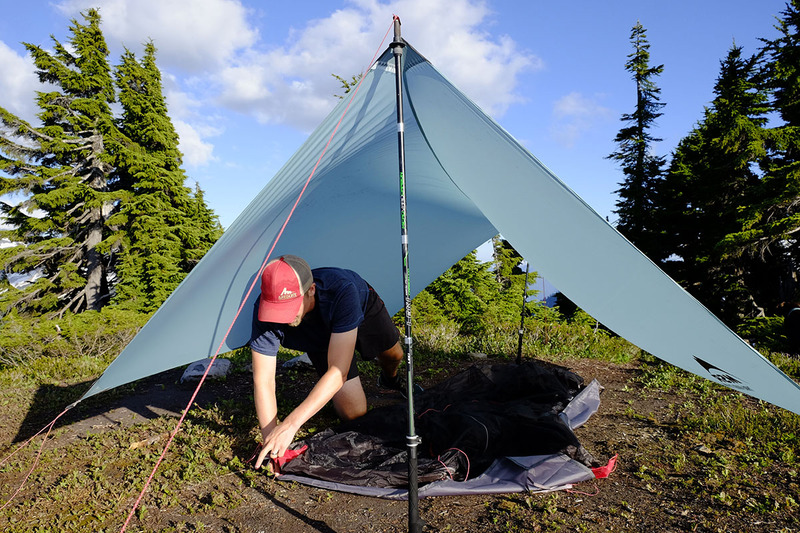 Folding poles take the prize for the smallest packed size, which is as little as 13 inches. Properly protected, they’re even small enough to store inside a daypack. Not everyone puts such a high value on a compact size, which is partly why three-section poles remain the most popular style on the market. Their average minimum length is 24 to 27 inches, which is small enough to attach to the outside of a backpacking pack, and also can fit into most luggage. 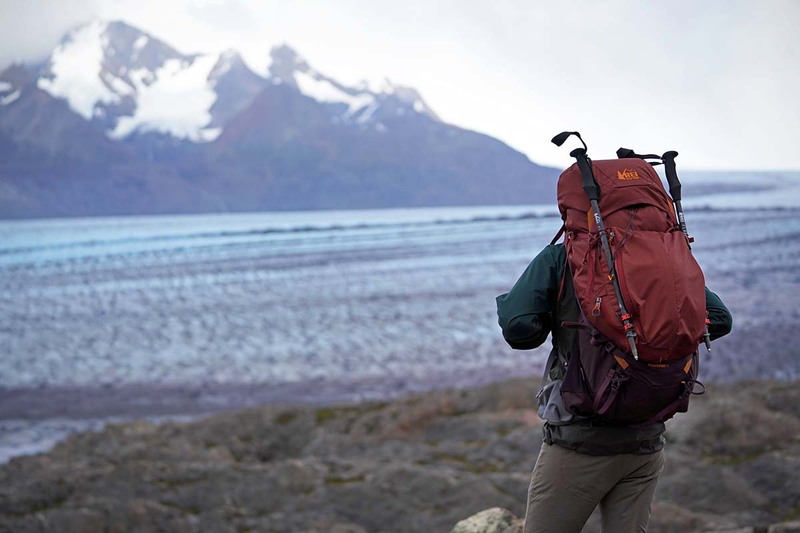 Two-section telescoping designs are where it may become an issue for squeezing into a duffel or suitcase (the Gossamer Gear LT4 is 33-inches collapsed), and you can forget about traveling with a fixed-length pole. 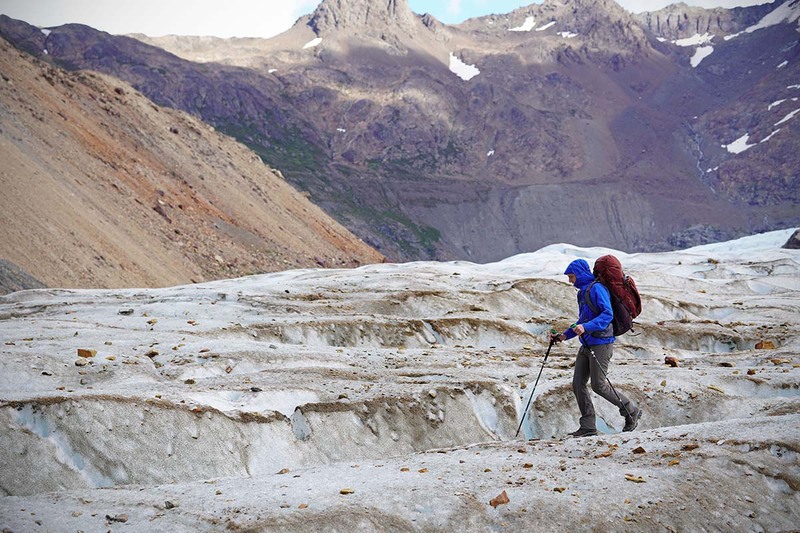 For trekking poles, durability and weight almost always go hand in hand. The first places manufacturers look to cut weight are the thickness of the material and the diameter of the pole. A smaller diameter and thinner pole logically will be less durable and flex more under pressure than its wider and thicker counterpart. The other part of the equation is the material itself. As mentioned above, even though aluminum may not be as strong as carbon fiber, it is the better choice in terms of durability because it has a lesser chance of breaking. This is why some manufacturers make a hybrid carbon and aluminum pole with the aluminum section at the bottom. Banging up against trail debris or snagging the pole in-between rocks may only dent or bend the aluminum rather than crack or shatter the carbon. As with any piece of outdoor gear, it’s best to think through your individual needs. Because we like to use our trekking poles year-round and on varied terrain, we’re willing to deal with the extra couple ounces to get a more reliable build like the proven Black Diamond Trail Ergo Cork. But if we were setting off on a thru-hike of the PCT, we’d be willing to compromise a lot more on durability. To keep your gear closet from overflowing (and your bank account plentiful), it’s always nice to find a single piece of gear that can be used year-round. A durable trekking pole can be just that: great for simple day hikes or backpacking trips in the summer, but burly enough for snowshoeing or even the occasional ski tour. 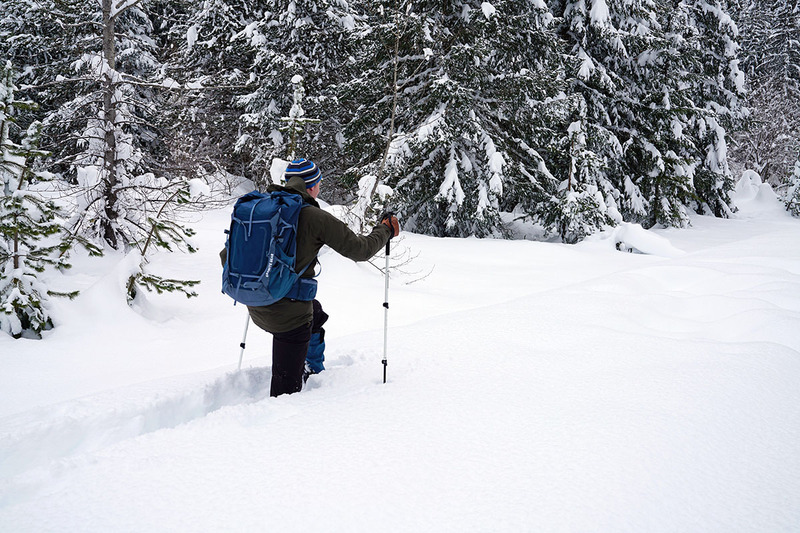 So what makes a trekking pole suitable for winter? Typically it will come from the telescoping category. The stiffer design and telescoping function is important for uphill and downhill travel, particularly for skiing or mountaineering. That said, there are some robust folding poles like the Black Diamond Alpine FLZ. Beyond having a strong shaft material, interchangeable baskets are a must for winter use. Many trekking poles come with, or offer as an accessory, powder snow baskets. The wide diameter baskets keep the poles from sinking in deep snow, just like a ski pole. Not all trekking poles have this option, however, so make sure to verify prior to purchasing. 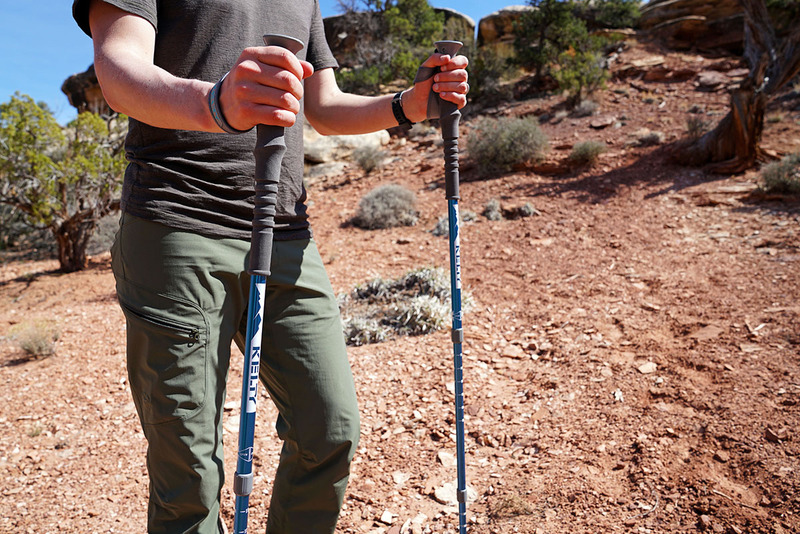 Adding shock absorption to trekking poles seems like a no-brainer. They have the built-in give that takes additional stress off of knees as well as your wrists on a long descent. But, a quick scan of the picks above will show only a few poles with shock absorption made our list. What gives? First and most importantly is the extra weight. On longer treks, those additional ounces really count (although the Leki system only adds 1 ounce per pole). Most importantly, simplicity in the outdoors is your friend, and one fewer part to break is a win for us. There are undoubtedly good reasons to get a shock-absorbing pole, but we encourage you to think through the compromises to make sure they’re worth it. Trekking poles are billed as a unisex product but there are a number of models that include a women’s version. What differentiates the women’s trekking pole is a narrower diameter grip, intended for smaller hands, and a shorter maximum length. For reference, the women’s version of the REI Co-op Flash Carbon poles can be extended to 47 inches, while the men’s extend to 55 inches. Realistically, anyone that doesn’t need the extra length and would benefit from the smaller diameter grips should choose a women’s trekking pole. Another benefit is women’s poles have a shorter minimum length (typically around 4-5 inches shorter in telescoping models), which makes them easier to stow away in a suitcase for traveling. Uncomfortable foam, cork disintegrating into your palms, wrist straps chafing your hands, frail locking mechanisms collapsing. Need we go on? A poorly made cheap trekking pole is just not worth it. Now we’re not saying you have to spend $150 to feel safe and secure; there are a number of poles under $100 that we still highly recommend. Moreover, if you are looking for a trekking pole for stability around town or want to try them without paying through the nose, you can forego some of the fancy lightweight features and get a classic aluminum pole at a reasonable price. The Kelty Upslope 2.0 telescoping poles (#14 on our list) are a great deal for around $40, and will do the trick for easy local trails and day hikes. If you plan to use the poles for backpacking, we still recommend sticking with the pricier options above it on the list. As with most items you get for the backcountry, it’s well worth it to get a piece of gear you can rely on.